What Fun! 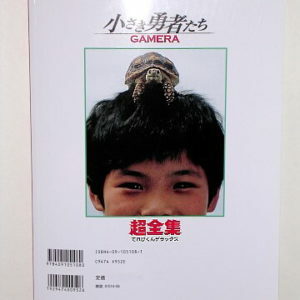 This is a must have for Gamera Fans. 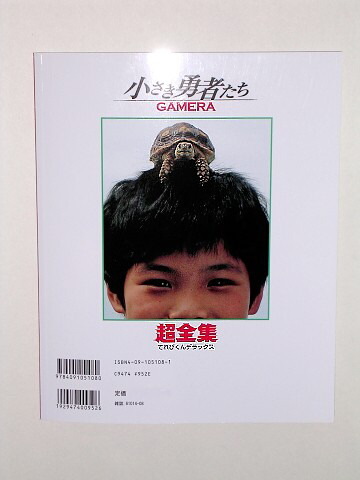 A book from the very latest GAMERA movie: GAMERA LITTLE BRAVES. 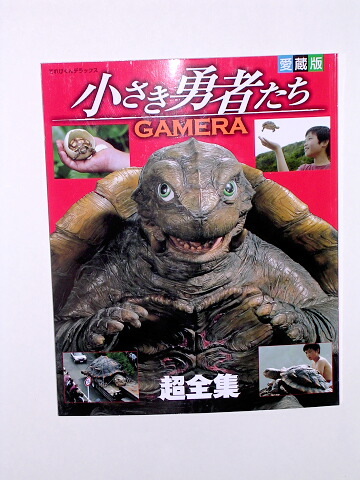 A 40th Anniversary of Gamera special published by Shogakukan 2006. 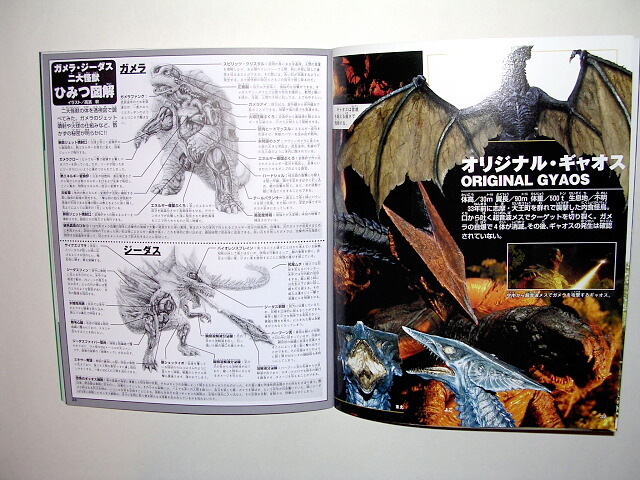 64 pages (mostly color) including an exciting foldout page of Gamera and Jidas. Contains lots of awesome action photos, behind the scenes, design sketches and special effects shots. Book measures approximately 8 1/2 by 10 inches. Here is the movie program ONLY available at some of the theaters showing the Newest incarnation of Guilala the X from Outerspace. The movie opened in Japan on July 26, 2008. The program is done in Japanese retro 60's style. The front and back covers resemble kids' books from that period with a place for a record inserted in the back cover. The "record" for the program is done in cardboard and is a promotion for the soundtrack by the band Cosmic Mind. The interior photos and graphics recall artwork from the late 1960's. There is a wonderful drawing of Guilala revealing his internal organs and their process! A diagram of the soundstage during filming of the movie pays subtle homage to Godzilla. It shows Guilala and the film director doing the Godzilla dance made popular in Godzilla vs Monster Zero! The program is 17 pages all in color! There is a center fold out that can be seen by gently opening the perforation along the edge. The artwork is awesome! Also contains photos of the theater exclusive and other merchandise produced for the movie. The dimensions of the program are 8 1/2 inches by 8 inches. Guilala Returns! That loveable Monster X from 1967 has been brought back in Guilala Stikes Back/G8 Summit Attack! The movie by Shochiku Company the same Producers of the 1967 movie was written and directed by Minoru Kawaski. He is an independent director with a definite taste for comedy. Without giving out too much of the movie story, we can say that it brings a new twist to the Daikaiju Genre. Guilala attacks during the G-8 Summit and the world leaders respond with methods for combat that reflect their cultural beliefs. Kawasaki handles this with hilarious satire. A must have for ALL KAIJU LOVERS! Scroll down to see additional photos. If you like artist cut away renditions of the INTERNAL WORKINGS of all your favorite Japanese Monsters then this is a MUST HAVE book. THIS IS ONE of OUR FAVORITE BOOKS to look AT. 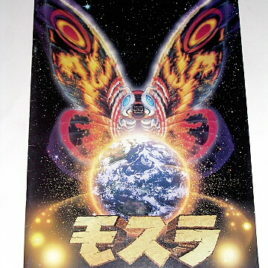 This book was published at the time of the movie Godzilla vs Mothra 1992. The book is a chronicle of Toho Monster movies from the 1960's until 1992. The most amzing aspect of this book is that it has artist drawings of over TWENTY Giant Monsters that reveal the inner workings of their bodies. Also the FOOTPRINT of each monster is shown. 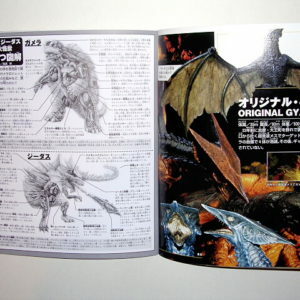 We have never seen a book with sooooo many GREAT interior diagrams of the monsters including Godzilla, Biollante, Battra, King Ghidorah, King Seesar, Mothra, Mechagodzilla, Rodan, Angilas, Jet Jaguar even Dagora. There are others we have not mentioned. This is a FUN book recommended for all Fans of Japanese Monsters!